Your students should be familiar with the 3rd conditional, but in need of practice. This is lesson is designed for a 1 hour 30 minute / 2 hour class. If you have a shorter class you can always change the first activity. Keep your eye on the time. Stage one (for longer classes)- Optional introductory mingle and fluency exercise. 15 minutes. Ask your students to write a sentence relating to something that they did at the weekend on a post-it note. Write your own – it should say – “I escaped from prison.” Do not show your students this note. Collect the notes and stick them to the whiteboard. Scan the notes to make sure they are understandable. Offer corrections if necessary. (Hold on to the note). Next ask the students to come and collect someone else’s post-it from the board. Tell the students they must find the author of the note, and ask a follow-up question, just like you did. Get the class to mingle in order to find the person who wrote the note. After you think they are more or less finished, stop the group and tell them that you still have a post-it note in your hand. Find out who it belonged to and ask your own follow-up question. Stage Two – Story telling and predictions – 25 -30 minutes. Your students will be itching to know why you went to prison. Tell them to sit down, and listen quietly – you are, after all, a dangerous prison escapee. Tell your students to draw a timeline on a piece of paper, so they can record the important events in your story. It is essential to concept-check as you tell the story. Pause to ask students comprehension questions and make predictions along the way. I have something to tell you all. You might find it hard to believe, but I had a really terrible weekend. Now listen carefully – because I’m going to ask you to retell this story in a moment, using the time-line I asked you to draw. I spent the entire weekend in prison. A horrible dark, dank prison, surrounded by rats, thieves, bank robbers and English teachers. How do you imagine prison to be? 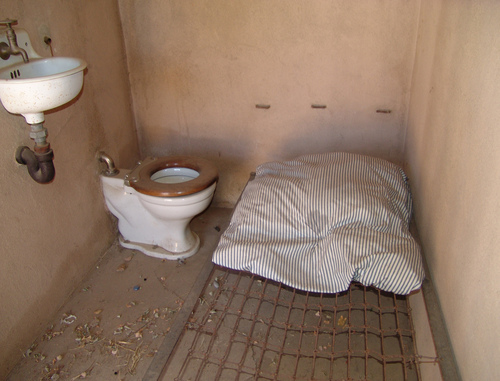 Here’s a picture of my cell. Is it how you imagined? Would you like to live there? Why not? I didn’t like it much either, that’s why I escaped. Saturday morning started like any other day. I woke up, took a shower and decided to go for a walk. I left my house at 10am and said hello to an elderly neighbour, Mr Potts. That’s when it all started to go wrong. He said he had a present for me. I was very pleased because he gave me a very nice Nike sports bag. He told me he was too old for things like that and that I should have it. Then he asked me if I was going into the city centre because he had a favour to ask. I was very happy to help him, especially since he had given me such a nice present. Would you have helped him? He asked me to deliver a cheque to the bank. I was happy to help, because Mr. Potts is very old and doesn’t like walking very far. He also told me that his grandson would be waiting outside the bank in his car, to give me a lift home. I thought that was very nice indeed. I took the envelope from him and walked to the city centre. I went straight to the bank to deliver his cheque. It was quite busy inside, but I didn’t queue for long. I said hello to the pretty blonde cashier and handed the envelope to her. What do you think happens next? (Get your students to predict the next part of the story). Suddenly an alarm went off. And a big glass screen came down between the cashier and myself. I couldn’t understand it, but everyone was lying on the floor. All of a sudden, the police arrived. They were pointing guns at me. Before I knew it I had been arrested and was whizzing to the police station in a fast car. I tried to tell the police what had happened. That Mr Potts and his son had done it all. None of them believed me, so I had to escape. Do you believe me? Ask your students to reconstruct the main details of the story on their time line. Monitor what they do and help with questions. Nice day went for a walk. I met Mr Potts and he gave me a present. I took an envelope from him to deliver to the bank. His son was waiting to drive me home. I did not open the envelope, I gave it to the cashier. I was arrested and went to prison. I escaped and came to class. If it hadn’t been a nice day, I wouldn’t have gone for a walk. Ask your students to look at their story notes and create a third conditional chain for your experience. If it hadn’t been a nice day, the teacher wouldn’t have gone for a walk. If the teacher hadn’t gone for a walk, he wouldn’t have met Mr Potts. If the teacher hadn’t met Mr Potts, Mr Potts wouldn’t have given him a present. Stage Five – error correction – to close of class. Ask groups to call out their 3rd conditional sentences and retell the story through conditionals as a class. Make corrections orally and put notes on the board. Given them a 3rd conditional writing homework. Awesome lesson. It went down very well with my students. you made it, you excelled yourself, better would be impossible, great idea, so creative and everything!! !